A decision today by Oxfordshire County Councillors on a planning application at Sutton Courtenay means that Thrupp Lake at Radley is likely to be saved permanently from destruction, say campaigners. The Lake was due to be filled with ash from Didcot ‘A’ Power Station. A new planning permission will allow Waste Recycling Group (WRG) Ltd, who operate the Sutton Courtenay Landfill Site next to the power station, to take and store up to 400,000 tonnes of surplus ash that might otherwise have been destined for Thrupp Lake . This should mean that Thrupp Lake will not now be needed for ash disposal. RWE npower, who operate the power station, put their controversial scheme to dispose of pulverised fuel ash (PFA )in Thrupp Lake on hold in February this year, but refused to rule out destroying the Lake at some time in the future. Today, County Councillors granted permission to WRG Ltd to stockpile 400,000 tonnes of ash from the Power Station at its Sutton Courtenay Landfill Site. The Landfill Site is right next to the Power Station, and the ash can readily be moved there without using public roads. WRG will use the ash for engineering purposes and restoration of the landfill site in the future. The stockpile forms part of a series of changes to the existing arrangements at the Landfill Site, designed to meet technical requirements and changing waste disposal needs. Under European legislation, the power station has to close by the end of 2015. This stockpile should be adequate to meet the power station’s ash disposal needs until then. “We are working with Npower to explore the possibilities for taking ash from Didcot Power Station. The County Council’s decision today on our planning application clears the way for discussion on this scheme to be progressed. “If it makes sense for both parties, we can get a supply of ash which we can use in our operations in the years ahead, and that means we won’t have to bring in large amounts of other material by road. Npower meanwhile could have a local outlet for ash which minimises environmental impacts. “I am delighted at this development, which should finally ensure that Thrupp Lake has a long and healthy future for local people to enjoy. “I welcome WRG Ltd and Npower working together to find a solution that protects a beautiful and important county wildlife site. 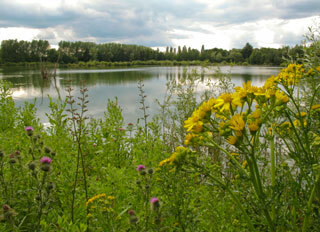 Save Radley Lakes expressed hope that it will now be able to work with the interested parties, including Npower, over the long-term development and management of the Radley Lakes as a wildlife and community resource.